Alloy Resources offers a large range of metal recycling services as well as made-to-order specification alloys. 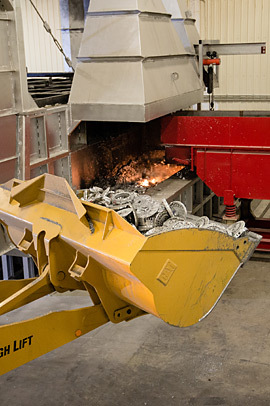 Our facility is equipped to process primary and secondary grades of aluminum scrap. This flexibility ensures that our customers receive the highest-quality materials. Our 90,000 lb. capacity reverberatory furnace has state of the art charging, degassing and pouring systems to ensure consistency in our products. When asked to create specific alloys, we guarantee that only the finest materials are used in our on-site metallurgy lab. After chemistry approval, our skimming process and flow-filtering system filters out the dross and non-metallic inclusions by the use of our specially engineered ceramic filtration system. 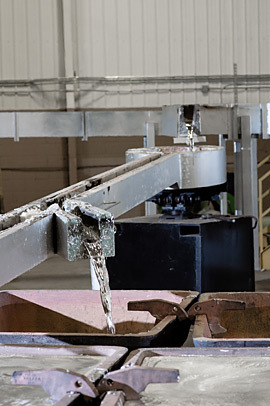 Alloy Resources offers closed loop solutions for our customer where we can toll their aluminum scrap.